Being healthy is something we all want. Have you heard about drinking lemon water after meal? Some recommend it drinking on an empty stomach, while others recommend it drinking it after meal. Is it ok to drink lemon water after meal and what are its benefits? Can You Drink Lemon Water After Meal? Yes, it’s ok to drink lemon water after meal, but not immediately after you have finished your meal. You should wait at least one hour to drink it. 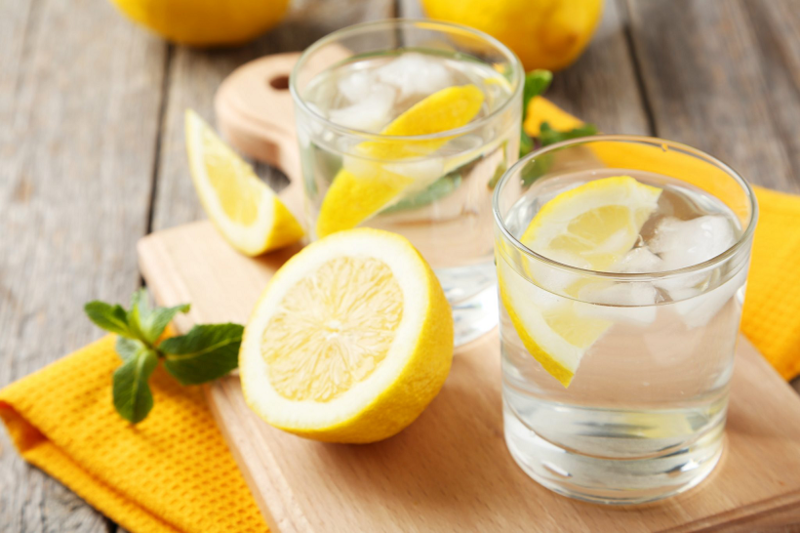 However, the best time to drink lemon water is when you just wake up in the morning on an empty stomach about 30 minutes before having breakfast. Drinking lemon water on an empty stomach about 30 minutes before having a meal, especially drinking it in the morning will help food digestion by increasing the production of necessary enzymes and the production of stomach acid. Certain enzymes and the stomach acid are very important for food digestion because they help break down the food making it possible for the gastrointestinal system to absorb all the necessary nutrients form a certain type of food. Drinking lemon water after meal or during the meal, together with any other kind of fluid is not recommended as it will slow down the digestion. Lemon water or other fluids will only dilute the body’s digestive juices, prolonging and slowing down the digestion. The digestive process itself can take several hours depending on the foods that you have consumed. The major part of the foods that you have consumed are digested within the first hour, so it is very important not to drink anything in this timeframe. Wait an hour before drinking lemon water or any other beverage. Another thing you should keep in mind is that digestion is a chemical process which generates heat. If during food digestion, and especially if during the first hour after you have had a meal, you drink any cold beverages, you will only prolong the digestion and slow it down. If you are a person that needs to drink something during a meal or immediately after a meal than I recommend drinking filtered water or warm tea. In general, if you have the need to drink during a meal or immediately after a meal because you feel thirsty, then it’s probably due to the fact that the foods you are eating contain too much salt or that your body is dehydrated. A good digestion is very important for overall health. Instead of drinking lemon water after meal immediately, you can try the following things for a better digestion. Resting is important after having a meal, especially after a heavy meal as it will give your body time to digest the food, by helping the digestive system function normally. After a heavy meal you have probably felt tired. It is something completely normal as the brain diverts the energy toward the digestive system needed for food digestion. For this reason, it is advised to sit or lie down for a couple of minutes after having a heavy meal. By resting for about 15 to 20 minutes you will avoid the deposition of fat in your body. Once you have rested for a couple of minutes you can go for a walk. Walking will help you improve the food digestion. Eventually, you will feel light and good. However, don’t run or do any other physical activity that requires excess strength and energy as it will be very hard on your body and especially on your digestive system. As all the energy is directed toward the digestive system, it’s normal not the have the necessary strength to run or do any other physical activity, at least not until the meal you have just had is digested. After a heavy meal drinking green tea might help as it will reduce the feeling of fullness. Green tea is an herbal tea known for many health benefits, including the fact that it promotes and improves digestion. If you don’t prefer green tea, then other herbal tea such as ginger, chamomile, mint, or peppermint tea are also very effective in improving digestion. Herbal tea will help clean up the body from toxins. For better health benefits of lemon water, make sure to drink it once you have woken up, at least 30 minutes before having breakfast. For this purpose, take a lemon and slice it into the half. Squeeze the juice of the lemon from both halves in a cup filled with lukewarm water. Drink this lemon water every morning after waking up. If possible, use fresh and organic lemons for better health benefits. Squeezing portions of lemon peel and adding them to the lemon water is also very healthy. Did you know that the lemon peel contains 5 more times vitamin C than the lemon juice itself? The lemon peel is also rich in fibers as well. If you want to be healthy and promote food digestion, then drink lemon water, just drink it at least 30 minutes before having a meal or at least one hour after having a meal.